Twitch's days could be numbered. The game streaming giant is, well, a giant—but Steam is a whole lot bigger. And Steam just entered the live game broadcasting ring. 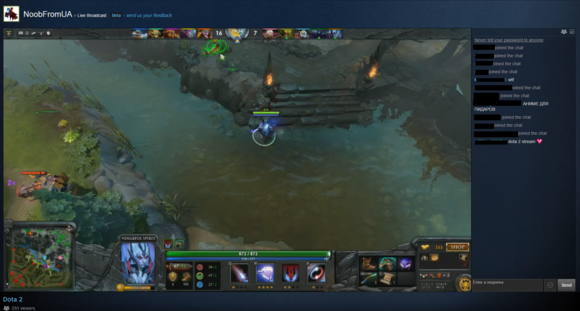 On Tuesday, Valve announced that you can now broadcast your games right within Steam itself. It's a bit different than Twitch's implementation at the moment, though. Instead of being more of a performance for random crowds of people, it's more like the way OnLive used to (still?) let you spy on other player's gaming sessions. If you opt in to broadcasting—you'll need to be using the Steam Beta Client—every time you start playing a game on Steam it allows other people to watch you. You have a few privacy settings—"Only friends that I invite," "Friends can request to watch my games," "Friends can watch my games," and "Anyone can watch my games." The last is the most Twitch-like, with your game session showing up in the Steam hub for that title. But Twitch doesn't need to worry yet. A lot of what makes Twitch streaming so captivating isn't implemented in this early version of Steam's broadcasts—you can't (as far as I can tell) hook up a webcam for picture-in-picture, which removes a lot of the "personality" from the streams. It is literally just you watching someone playing a game with audio commentary. Finding streams by specific people is also a chore unless they're on your friends list. Hell, finding streams in the first place is a chore since you have to go to the specific community hub for each game. And there's the little matter of streams not being supported in Firefox currently which is... a bit crazy. Also, Steam broadcasts are already being used for illegal content thanks to Steam's "Add a Program" feature. Four of the top five broadcasts on Steam as I write this article are either Media Player Classic Home Cinema or VLC Media Player broadcasting TV shows and movies. Other users are throwing copyrighted music over top of their broadcasts, which is another no-no outlawed by YouTube and recently cracked down on by Twitch. It's the Wild West all over again. The video seemed smooth though, in the little time I watched someone stream Binding of Isaac: Rebirth. I'm curious what kind of tax this puts on your system, especially if you just always have your channel open for broadcasting, but hopefully that becomes less of an issue as solutions like Nvidia Shadowplay and OBS get better. This is a step towards the convenience of current-gen consoles and their "Broadcast at the touch of a button" philosophy. It's also great to see a competitor to Twitch, which has gotten to rest on its laurels lately. Now we'll see whether Steam can add important features (webcam support, advertisements for revenue generation, the ability to archive streams, the ability to export those archives to YouTube, et cetera) to bring the Twitch old guard over.